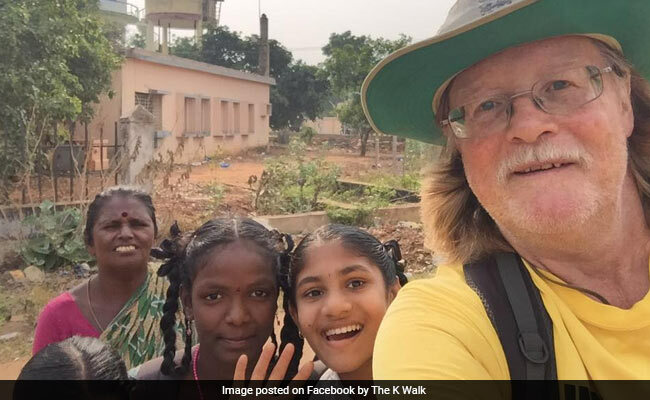 New Delhi: A British retiree walked over 2,500 kilometres along India's east coast to raise money for a Kolkata-based nonprofit. Patrick Baddeley set off from India's southernmost tip of Kanyakumari last October and managed to cross Tamil Nadu, Andhra Pradesh, Odisha and reached Kolkata in late February. Mr Baddeley carefully documented his journey on Facebook and the page offers a lovely insight into everyday life in India. Mr Baddeley was walking to raise money for Future Hope, a charity based in Kolkata, which provides shelter and schooling for street children. He managed to raise 11,757 British pounds (close to 10 lakh rupees) from 124 donors on the fundraising platform JustGiving. He exceeded his original target of 10,000 pounds (a little over 8 lakh rupees). The walk, dubbed K-walk, was dedicated to the memory of his late daughter Katie. "I first went to India as a long-haired student in 1973. Thus began a love affair that has continued to this day," wrote Mr Baddeley on his fundraising page. "I retired at the end of 2015 and for several years had been hatching a plan to do a long walk in India in order to raise funds for Future Hope." He went on to describe how the long walk was rooted in Indian tradition from Mahatma Gandhi's Dandi Satyagraha to the long distances walked by pilgrims to religious sites. Did you find Mr Baddeley's charity walk inspiring? Do let us know in the comments section below.